My Dog Tail Tucked, Shaking- Why? Dogs communicate mostly through body language. The way they feel toward you, toward strangers, and toward other dogs is conveyed through what they do with their bodies. A dog uses his tail to speak to you and tell you how things are with him emotionally. Imagine your dog, tail tucked, shaking – what does that mean? Probably a dog is not comfortable at all with whatever is happening around him! Fortunately, you can figure out what makes your dog tick by observing for the clues. A dog's tail between legs is one indication of a problem happening. Here's how to spot problems before they become bigger issues. Fright. If your dog is afraid, he might start to shake. Imagine your dog, shaking, tail between legs – that's not a good image, is it? This often means your dog is trying to look as small as possible, so he doesn't appear threatening to anyone, and will hopefully be left alone. Pain. A dog in pain might shake and tuck his tail. It is very important to watch for signs that your dog might be hurting, and take him to the vet immediately if you notice that he is uncomfortable. Defensiveness. A defensive dog might be annoyed with those around him and tuck his tail between his legs to indicate that he wants to be left alone. Be wary of this, because the dog might become aggressive in order to protect himself from what he perceives is a threat. Anxiety. Imagine your dog, tail tucked, shaking – that likely means fear, but it could also mean anxiety. A dog can become anxious when lifestyle changes happen, such as moving to a new home or becoming friends with new dogs. They need stability, yet life changes upset that balance and security they love so much. Esteem. Sometimes a tucked tail is actually a sign of respect. This is especially true with puppies happy to see a dog that is obviously their alpha. They will tuck their tail while wagging it. Degree of Emotion. How badly is your dog shaking, and how far is he tucking his tail? This could indicate just how bad the problem is. 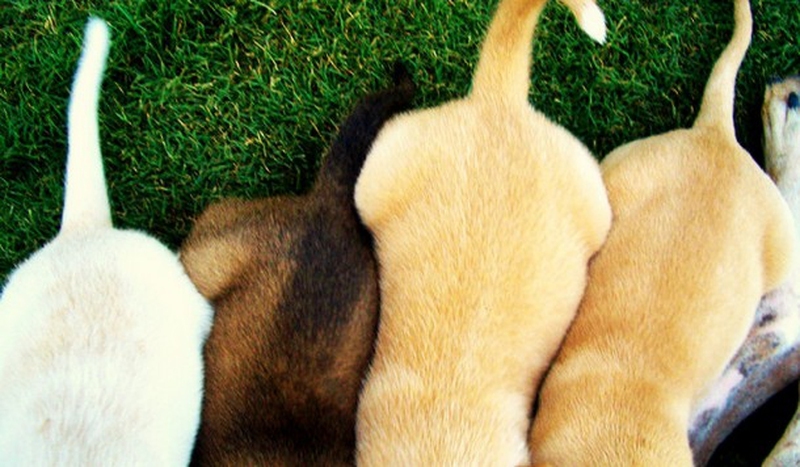 If the tail is completely tucked against his belly, chances are your dog is very upset. Wagging the tail. In most cases, dogs that are wagging the tail are happy. They are alert, engaged, and ready to explore or play. This is often true even when the dog is barking. Remember, sometimes it can be a happy bark that allows him to communicate with other dogs. If your dog has his hackles raised and is snarling, or if the wagging tail is slow and in an unusual position, that might mean aggression, so be careful. Exposing the teeth. A dog rolling his lips back to expose his teeth is an important warning. A dog that growls and snarls at the same time is definitely cause for concern. In this case, the dog, tail tucked, shaking, might not mean fear at all, but rather aggression that is going to burst out into the open very soon. Flattened ears. This often means that a dog is angry and ready to fight. Watch out for a dog who has these flattened ears as well as a wary stare or an angry stance, whether or not the tail is tucked or the dog is shaking. Ears up. On the other hand, a dog with ears straight forward and up is paying close attention to something. It might be an interesting game, a squirrel running across the yard or even another dog that appears to be friendly. High-pitched whine. This is often indicative of a dog that wants something. You will likely hear the whine when you pull out the food bowl or grab the leash for a fun romp outside. But pay attention if the dog doesn't seem excited, as that whine could mean anxiety or pain. Rolling over and show belly. A dog that exposes their underbelly is being very submissive. This often means he wants a belly rub – he trusts you! When he does this before other dogs, it makes it clear he is letting them take control. But if your dog, tail tucked, shaking, rolls over to expose the underbelly, it could also mean serious fear. It's time to reassure him! The stance. A dog that is happy and unconcerned will likely have a very relaxed stance and walk. Those who are not making eye contact, tucking their tail, shaking or trying to avoid going in a particular direction might be intimidated. A dog that is tense and alert might be on the verge of aggression.